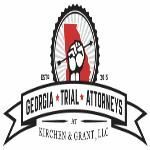 Georgia Trial Attorneys at Kirchen & Grant, LLC - Georgia Trial Attorneys is a litigation boutique specializing in litigating complex cases, with a particular focus on personal injury, family law, and criminal defense. In helping our clients in extremely difficult times, we draw upon our experience and skill. The attorneys at Georgia Trial Attorneys are equally adept at representing clients regarding all matters of personal injuries, family law and criminal defense. Using a team approach, we draw upon our broad base of expertise to provide our clients with the highest quality legal advice tailored to his or her particular needs.